Red-figure epinetron from Eretria. 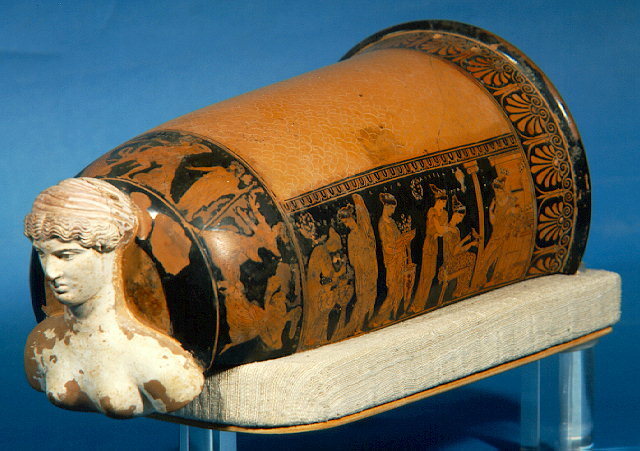 This Attic vase was used for the spinning of wool and it was found at Eretria. The painted compositions on both sides depict the nymph Alkestis among her friends, Harmonia, Eros, Hebe and Aphrodite. Around the plastic protome at the edge, Peleus and Thetis are represented. It is the work of the Eretria painter, dated to ca. 425 B.C. Inv. no. 1629.